Seventy-three years ago today, the world changed. With the dropping of one bomb on Hiroshima Japan, mankind had finally found a weapon that could wipe out the entire population, literally at once. The United States had been working on developing an atomic weapon, after having been warned by Albert Einstein that Nazi Germany was already researching nuclear weapons. By the time the United States conducted the first successful test (July 1945), Germany had already been defeated. But the war against Japan wasn’t over. President Harry S. Truman was warned by his advisers that any attempt to invade Japan would result in a horrific number of deaths–up to a million. So he ordered that the new weapon used to bring the war to a speedy end. On August 6, 1945, the American bomber Enola Gay dropped a five-ton bomb over the Japanese city of Hiroshima. A blast equivalent to the power of 15,000 tons of TNT reduced five square miles of the city to ruins and immediately killed 80,000 people. Tens of thousands more died in the following weeks from wounds and radiation poisoning. 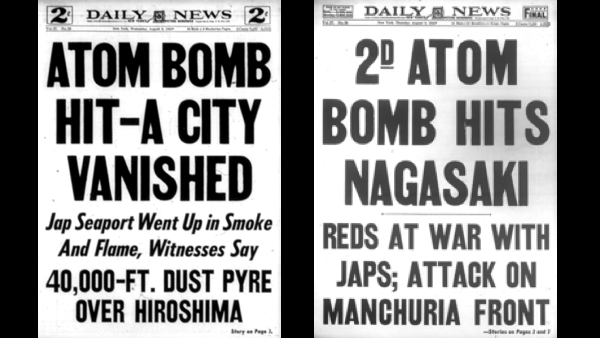 On August 9th, three days later another bomb was dropped on the city of Nagasaki, killing nearly 40,000 more people. 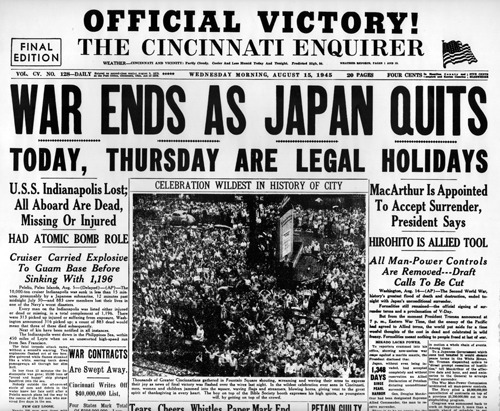 A few days later, Japan finally announced its surrender. 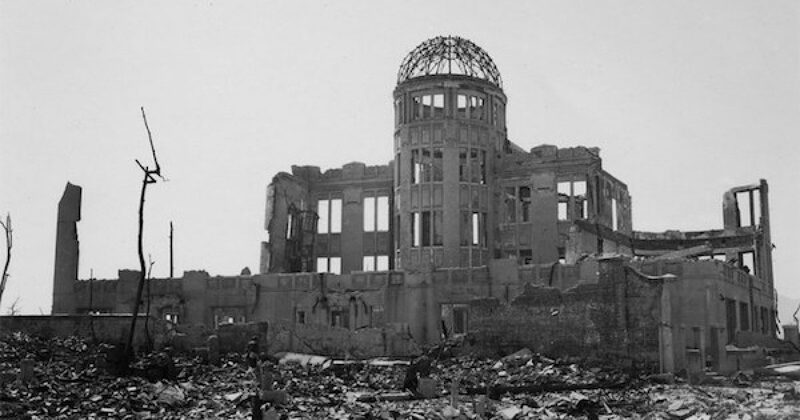 Lately, there has been much revisionist history about the dropping of the atomic bombs on Hiroshima and Nagasaki. Some say that Japan was poised to surrender before these horrible weapons were dropped, that Truman did not have to use the Atomic Bomb. If this was the case, no one told Truman– no one informed the Japanese Emperor either. At noon on August 15, 1945, the Emperor of Japan announced Japan’s surrender over the radio. This was the first time in history the people of Japan had ever heard their Emperor’s voice. He blamed the surrender on the horrible new weapon. Soon after the US developed the atomic bomb others nations developed nuclear weapons also. In 1949 the world was horrified as Soviet Russia tested an atomic weapon. The world settled into what eventually became known as mutually assured destruction (MAT). No nation wanted to use nuclear weapons because any first strike could be answered with an equally destructive response. Over seven decades later nine countries have gone nuclear. Along with the U.S., there is Russia, United Kingdom, France, China, India, Pakistan, North Korea, and Israel (although officially Israel will not say whether or not they have nuclear weapons). Beyond those, we know that Iran is too close to the weapon, and the JCPOA doesn’t stop them from building a nuclear weapon—it just delays them a bit. The use of the atomic bomb to end WWII was as horrible as it was necessary. Two bombs ended up killing over two hundred thousand people, wounding countless others (and that doesn’t even include the birth defects) but it was still much less than what a land invasion would have caused. By seeing the destruction, the repugnant human devastation of this weapon mankind may have worked even harder never to use it again. Thankfully in the seventy-three years since, no country has dared to use these horrific weapons whose killing power has been refined and expanded. But there is no doubt about it President Truman made the right decision.